Mp3 Music Explorer helps you manage your music. 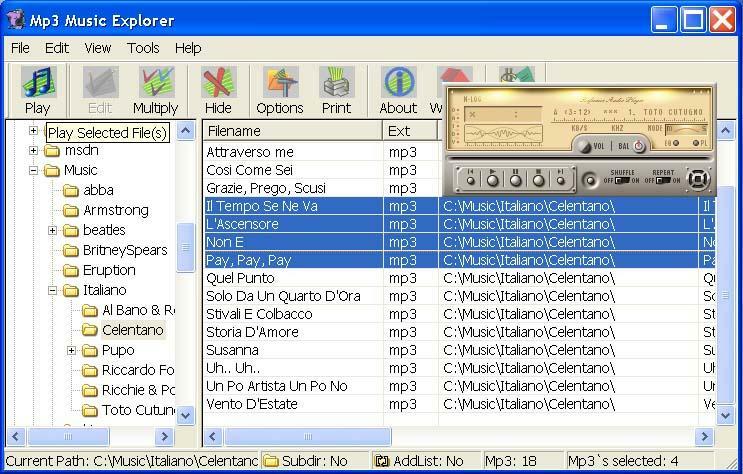 This program looks for music files on your computer disks and in separated folders. Files are shown in the list. You can sort it by albums, artists, titles, etc. You can play selected files and create play lists. If you want to send somebody information about your music collection the program will create a report for you. Html, xml, and txt reports are supported. The program supports file operations such as coping, moving, renaming, deleting, and editing MP3 tags. Music files can be renamed according MP3 tags.